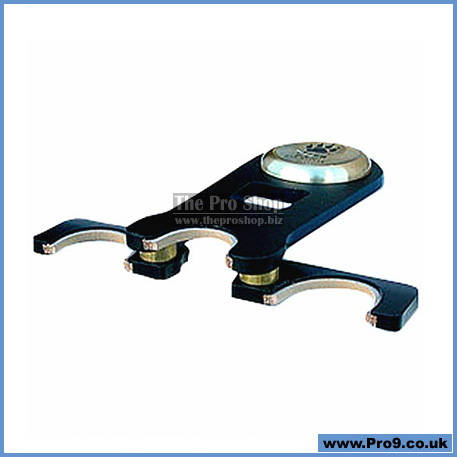 The Tiger Paw Cue Holder made of high impact Acrylic Plastic is anchored with a brass center and lined with vinyl pads to secure it into place. The Tiger Paw Cue Holder is flexible enough to accommodate all bar tables, regardless of the shape. All you need to do is set it on the table top and open its arms. The Tiger Paw holds either 3 or 5 cues, small enough to fit in any cue case pouch and is lined with quality pig leather to protect your cues from marks and scratches. One Allen head wrench if you need to adjust the tension for the arms is included in every package and a black carrying suede pouch. 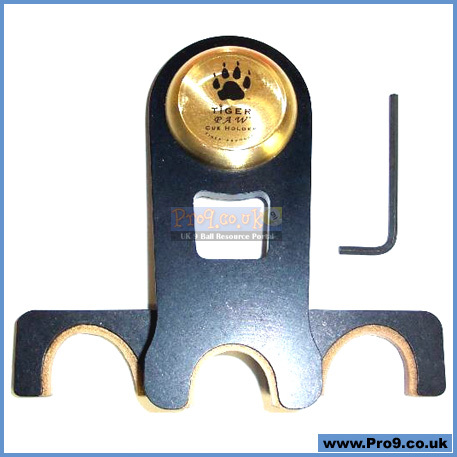 Tiger Paw Cue Holder, get a grip! This is one of the "Rolls Royce" of cue caddys, beautifully constructed from quality materials, with precision and longevity built in. The ability to fold the "wings" after use, affords a huge space saving and enables storage in even the smallest cue case. "Sticky" rubber studs underneath the Tiger Paw hold the device gently to any surface, providing a safe and convenient place to leave your cue.